Our product range includes a wide range of candid b cream, fusidic acid cream, neomycin sulphate cream, retino a cream and tretinoin cream. 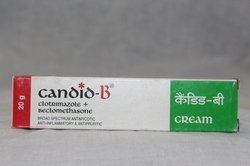 Candid-B Cream Is Used In The Treatment Of Skin Infections. Candid-B Cream Is A Combination Of Two Medicines: Beclometasone And Clotrimazole Which Treat Skin Infections. 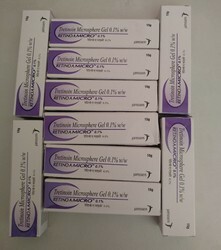 Beclometasone Is A Steroid Which Blocks The Production Of Certain Chemical Messengers (Prostaglandins) That Make The Skin Red, Swollen And Itchy. Clotrimazole Is An Antifungal Which Stops The Growth Of Fungi On The Skin By Preventing Them From Forming Their Own Protective Covering. Fucidin H Cream is used in the treatment of skin infections. Fucidin H Cream is a combination of three medicines: Hydrocortis one and Fusidic Acid which treat skin infections. Hydrocortisone is a steroid medicine. It blocks the production of certain chemical messengers (prostaglandins) that make the skin red, swollen and itchy. Fusidic Acid is an antibiotic. It stops bacterial growth by preventing synthesis of essential proteins required by bacteria to carry out vital functions. Pregnancy weighs risks vs benefits Fucidin H Cream may be unsafe to use during pregnancy. Lactation No information is available on the use of Fucidin H Cream during lactation. Please consult your doctor. Application site reactions (burning, irritation, itching and redness). 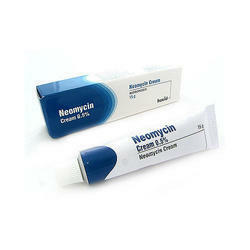 Neomycin Sulphate 350 mg Cream is used in the treatment of bacterial skin infections. Neomycin Sulphate 350 mg Cream is an antibiotic. It stops bacterial growth by preventing synthesis of essential proteins required by bacteria to carry out vital functions. Pregnancy weighs risks vs benefits Neomycin Sulphate 350 mg Cream may be unsafe to use during pregnancy. Lactation Neomycin Sulphate 350 mg Cream is probably safe to use during lactation. Limited human data suggest that the drug does not represent a significant risk to the baby. The baby's skin should not come into direct contact with the treated area of skin. The water-miscible cream/gel is preferred as ointments may expose the baby to harmful effects of Neomycin Sulphate 350 mg Cream via licking. What If You Miss A Dose Of Neomycin Sulphate Cream? If you miss a dose of Neomycin Sulphate 350 mg Cream, please consult your doctor. 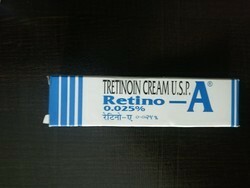 Retino-A 0.1% Cream Is Used In The Treatment Of Acne. Retino-A 0.1% Cream Is A Form Of Vitamin A. When Applied On Scalp, It Works By Promoting The Growth Of Hair Follicles, Thereby Stimulating Hair Growth. When Used On Skin, It Reduces Oil Production In The Skin, Replenishes Acne-Prone Skin And Helps Keep Your Pores Open. If You Miss A Dose Of Retino-A 0.1% Cream, Take It As Soon As Possible. However, If It Is Almost Time For Your Next Dose, Skip The Missed Dose And Go Back To Your Regular Schedule. Do Not Double The Dose. Retino-A 0.025% Cream Is Used In The Treatment Of Acne. Retino-A 0.025% Cream Is A Form Of Vitamin A. When Applied On Scalp, It Works By Promoting The Growth Of Hair Follicles, Thereby Stimulating Hair Growth. When Used On Skin, It Reduces Oil Production In The Skin, Replenishes Acne-Prone Skin And Helps Keep Your Pores Open. Pregnancy Weigh Risks Vs Benefits Retino-A 0.025% Cream May Be Unsafe To Use During Pregnancy. Animal Studies Have Shown Adverse Effects On The Foetus, However, There Are Limited Human Studies. The Benefits From Use In Pregnant Women May Be Acceptable Despite The Risk.